I wish my toes were in the sand as I write this. What would be better than sitting on a beach and sipping a Mai Tai? Unfortunately, I can’t get to a beach this week, so I’ll have to settle for sipping a Mai Tai while sitting in my backyard. When I read the article about Mai Tais on The Atlantic last month, I realized that this cocktail could be a vacation in a glass. A regular weekend quickly becomes more interesting when you have a fruity, tropical cocktail in hand. The article I read mentioned drinks that are like liquid candy and drinks that allow you to taste the rum and tartness. The recipe offered was of the latter type, and I had to try it. It’s made with lime juice, Cointreau, simple syrup, rum, and Orgeat syrup. I’d heard of Orgeat before, but I wasn’t sure I’d be able to find it locally. First, it’s pronounced or-zha not or-geet, and the important thing about it is its almond flavor. My first stop in my search for it was a well-stocked liquor store, where the person who helped me locate it mispronounced it. Not a good sign. The product I was shown was a big bottle full of artificial flavors, etc. I decided to keep looking. I checked online and learned that Monin brand makes an Orgeat syrup, and it has the exact same ingredients as their almond syrup. So, when I located Monin almond, I went with that. Now, the recipe from The Atlantic was very specific about the type of rum to use as Appleton 21-year old was mentioned by name. I wasn’t feeling that picky since I had some good, aged rum in the house which we had poured into a decanter, and for the life of me I can’t remember what brand it is. The recipe also suggests floating Demerara rum on top as an option. I skipped that option. 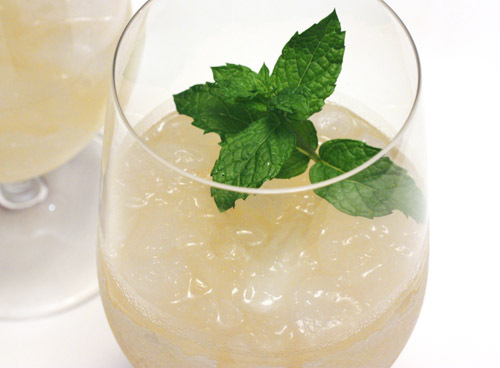 Aged rum, lime juice, Cointreau, simple syrup, and Orgeat or almond syrup were placed in a cocktail shaker with ice, it was given a good shaking, and it was poured over crushed ice in a glass. I did follow the instructions regarding garnishing with mint since the mint in my garden hasn’t died yet this year. One sip of this, and you’ll imagine the sound of waves crashing nearby. It’s the Orgeat that gives it that tropical vibe. 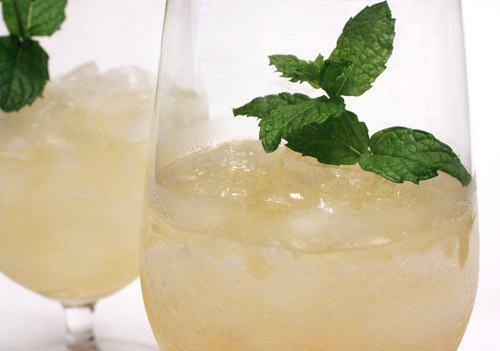 It blends with the tart lime and rum and adds a distinctive, happy, rounded flavor. My drink is ready and all I need is the surf, the sand, and a palm tree or two. this sounds delicious! in hawai'i, you could definitely find the 'candy' type, but we were able to find a handful of bartenders that made fantastic mai tais. without fail, however, after the drink was poured into the glass, it was topped off with some dark rum. it's a beautiful presentation because it bleeds down onto glass as you drink it. and of course, i got my daily dose of fruit (as pineapple garnish) this way! p.s. your tireless searches for esoteric ingredients continue to impress me! I haven't had a mai tai since 1986!!! I am all about cocktails this summer! I've have not had a mai tai in years, and it is a vacation in a glass. Thanks for reminding me. That would be perfect right to enjoy Mai Tai on a pristine white sandy beach. I'm so unsophisticated. I didn't even know what Mai Tai is until now. I would have thought it was a Thai dish, lol. When did I last have mai tai? I guess it's ages ago...a very delightful cocktail! Must try this one,...thanks for sharing, Lisa! I am so handing this over to the husband! He's the tender of the bar and always willing to make up a refreshing drink. Come to think of it, I don't believe I have ever had a Mai Tai - a lack that most definitely has to be remedied. Thank you for doing the legwork on tracking down Orgeat (or a suitable substitute) - I look forward to tasting the almond flavor! I so remember the Mai Tai craze. My parents use to have them on the patio in the summer. I think its time to bring them back into the main stream again, they sound delicious. I want one of these right now! I haven't had a mai tai in forver - and this looks fresh and cool and lovely. my experience with this beverage is limited to crossword clues reading "____ tai." regardless, it looks quite lovely! this sounds so great, especially that it's made with almond syrup, yum! Oh! Monday is not over yet and Isure can have a sip of this drink...looks so yummie! That looks like one mighty fine cocktail to kick back with. No wonder the mai tai has stood the test of time. Just looking at your photo is making me thirsty! When you can't go to the beach...bring the beach to you! I like the way you think. There isn't a beach in my near future...but I highly suspect there will be a Mai Tai! Hmmm. And to think...mai tais aren't red! This is surprising news just so you know. Last weekend I was asking my hubby to make mai tai for me. delightful.